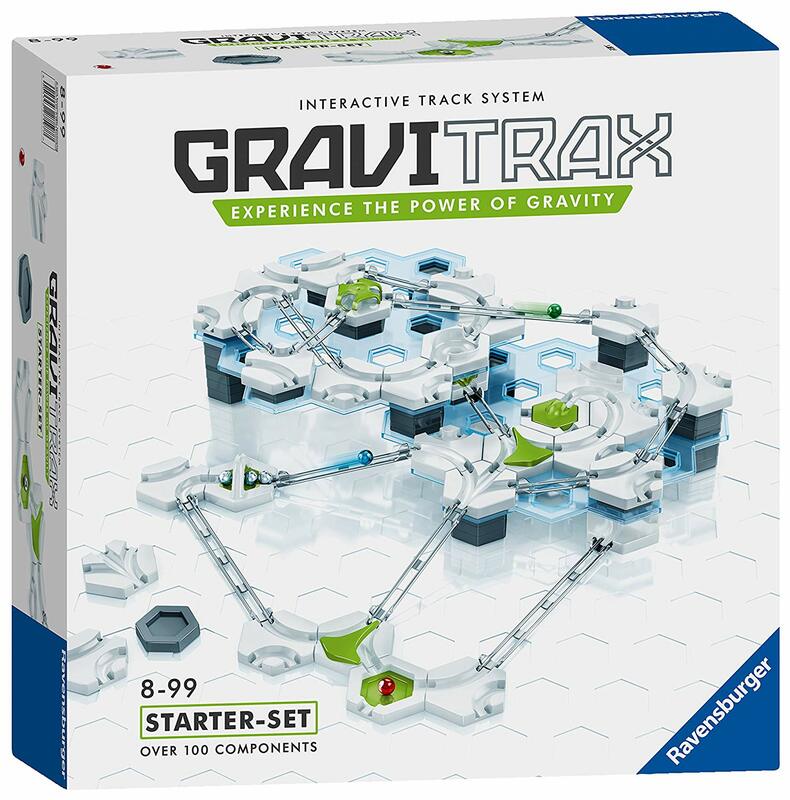 I am very excited to tell you about GraviTrax, an awesome new STEM (Science, Technology, Engineering and Maths) track system from Ravensburger. If you are looking for something to keep the kids entertained over the upcoming six weeks summer break then this is perfect and it has the added bonus of teaching them about gravity, magnetism and kinetic energy. Kids learn best when they are having fun and Gravitrax is guaranteed to deliver on the fun factor. I should also mention it is a lot of fun for us "big kids" too so will keep everyone happy. 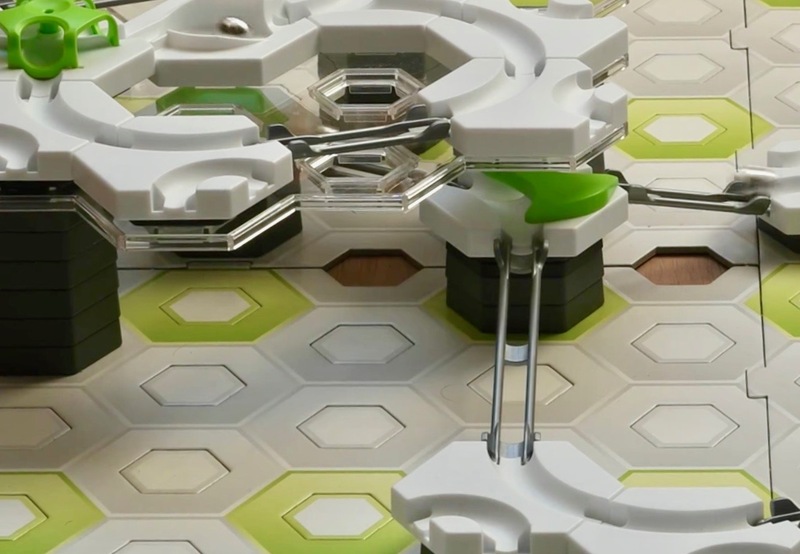 GraviTrax takes marble runs to the next level, allowing little engineers to design and build structures using STEM concepts. Inside the box, you will find lots of pieces and components but don't worry there are clear instructions and guides included to help you get started. 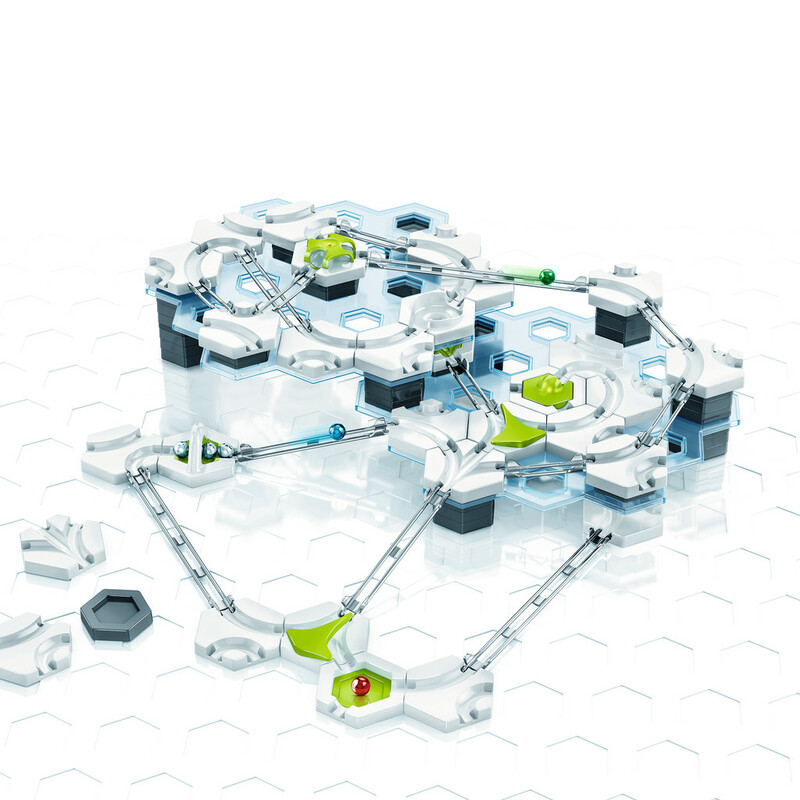 The set includes a set of Instructions, a set of Blueprint, an Exercise booklet, 4 Card Bases, 2 Transparent levels, 6 Gravity Spheres, 3 Long Rails, 6 Medium Rails, 9 Short Rails, a Magnetic Cannon, 21 Curved Bases, 3 ‘X’ intersection Bases, a Vortex Base, 2 ‘Y’ Points Bases, an End target, a 3in1 Base, 4 Bases for inserts, a 3 Way Starter Base Insert, 2 Catcher Base Inserts, 2 Switches, a Base Insert, a Free Fall Base Insert, a Target Base Insert, 40 Large Vertical Tiles and12 Small Vertical Tiles. After you have opened the box and been amazed at just how many pieces are inside, I recommend taking a really good look at Instructions and then the Task Booklet and Construction Plans. The difficulty levels are colour coded so you may want to opt for an easy one to begin with. We started off with an easy design from the Construction Plans which are straightforward to follow and got us up and running really quickly. We then moved on to something a bit trickier and even more fun. The individual pieces are all of a high quality, strong and built to stand the test of time as your little engineers get busy working on design after design. The plastic bases slot in easily to the cardboard base and the other pieces fit together as expected. I have tested similar types of sets in the past where the bits don't quite fit properly and it can really impact the overall result but I am pleased to say this is not the case with GraviTrax. It wasn't long before the kids were busy linking a variety of bases, with rails, using switches and even a magnetic cannon which the boys love. The possibilities are endless and it is all about trial and error as you pop the balls in and put your engineering and architecture to the test. We have been loving putting GraviTrax to the test, it is definitely a very engaging set which has been getting lots of use. The guides are great for inspiration but it wasn't long before the kids began working on their own custom designs, both individually and joining up to work as a team together. With over 100 pieces and 18 unique action parts they have been able to come up with some awesome designs, some may not have worked as planned at the start but that is the great thing about this set as it lets kids experiment. It is wonderful to observe the kids designing, building and then adjusting and readjusting their tracks, experimenting with heights and watching as magnetism, gravity and kinetics produce different results. It teaches them to build and test in iterations and then fix any issues and/or enhance before retesting just as you would do when building software which is a fantastic thing for them to learn in addition to the physics and engineering involved. We also downloaded the GraviTrax app where you can virtually create your track and test it. Ben likes doing this and then using it as a blueprint to work on the real-life version. I have to say I love the idea of being able to marry the tech and the physical versions. The GraviTrax Starter set is available to purchase online from Amazon and has an RRP of £49.99. 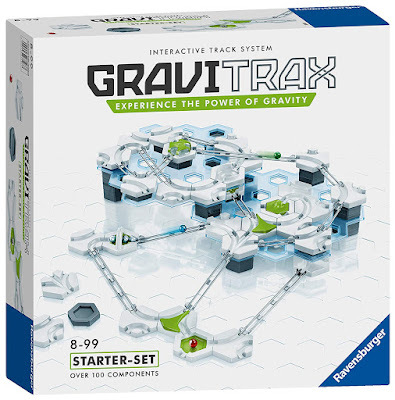 It is suitable for ages 8+ but the twins aged 5 have joined in playing with Ben who is 8 and really enjoy being part of the GraviTrax engineering team. The Gravitrax track system can be extended indefinitely with extra track packs and add-on's available to purchase separately.